This is by far my toughest blog to write this semester. This is my last blog post as I am graduating next Saturday. 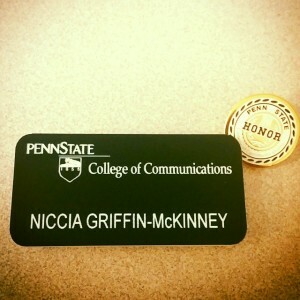 The past four years have been absolutely amazing and the fact that my time is almost up at Penn State is mind-blowing. Four years sounds like a long time and sometimes it may feel like it, but to be honest the four years flew by. It seems like only yesterday that my parents and siblings were dropping me off at my residence hall in Penn State Mont Alto. I was so excited, but nervous at the same time because it was college! It’s completely different from high school and I didn’t know what to expect. 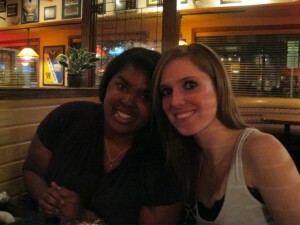 My freshman year roommate, Lauren and I at my birthday dinner at Applebee’s. 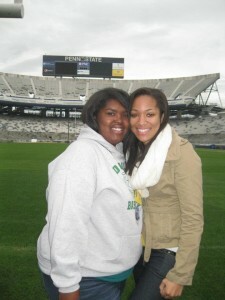 Anyone who reads my blog posts can see how much I love Penn State and that I’m going to miss it. One might think that it was my dream to attend the best university in the world. You’ll be surprised to know that I really didn’t want to go to Penn State. Let me clarify that it was nothing against Penn State, but the fact that both of my uncles attended Penn State and loved it, so my family thought it was a good idea for me to attend Penn State too. My uncles come back every year for football games with their best friends and have really great jobs because of their education at Penn State. My family knew the kind of education I could get at Penn State and really wanted me to come here. Our fun-loving mascot, the Penn State Nittany Lion. However, in an act of rebellion, I wanted to leave Pennsylvania altogether and not come to Penn State. I wanted to create my own memories and create my own legacy that was separate from my uncles. As a back-up I did apply to Penn State. I received acceptance letters from a couple of out-of-state schools and was on my way to Rhode Island (which is about six hours away from home) to attend Johnson and Wales University as a Fashion Merchandising and Retail Marketing student. However, financially it wasn’t possible for my mom to send me to a university six hours away. Spring forward to April of my senior year of high school and I receive a giant packet in the mail from Penn State, offering me admission to the university as a 2+2 student. 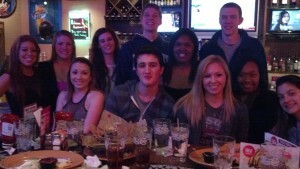 My birthday dinner sophomore year. I accepted, because if this was what my mother could afford then I was going to go. In August 2011, I started my college career at Penn State Mont Alto, meeting my roommate Lauren freshman year and some of my closest friends. I joined Lion Ambassadors at Mont Alto and instantly became great friends with some pretty phenomenal people and I realized that I made the right choice. I was doing pretty well at the time and we even traveled to University Park to tour Beaver Stadium. 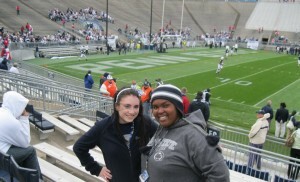 My friend Arianna and I at Beaver Stadium. Then November 5, 2011 happened and the university I had come to love was in the middle of a national scandal. All of a sudden I wasn’t just a student at Penn State and even though I wasn’t at University Park, I was still interviewed at Mont Alto. The turmoil that followed the scandal meant that I was defending myself against people on Facebook as to why I was still at Penn State and defending the school that I was growing to love. I went to my first Penn State football game freshman year in October and before I even entered Beaver Stadium, I could feel the pride and unity that current students and alumni possessed. Even though it was before that fateful day in November, I remembered what it felt like to be a part of something as big as a football Saturday in Happy Valley. That was when I realized that there is no way I would ever leave this university, despite what others may say and think. In the year that followed, I continued to defend the university that really became the best decision I’ve ever made, while also forming bonds and relationships with my friends at Mont Alto. Then I transitioned to University Park and loved it from the minute I got here. I was lucky enough to meet some pretty amazing people and gained hands-on experience in my major. Representing the College of Communications. CommStuCo Executive Board during our Honor Code Signing last semester. I joined the College of Communications Student Council (CommStuCo) and continued with my involvement with THON, becoming the co-chair for CommStuCo THON organization this year with my fellow co-chair, Hannah. I was happy to discover my passion for college recruiting while I was here through the opportunities the university had to offer me. It has been a rewarding experience being here for four years and I would come back in a heartbeat just to do it all over again. I can’t wait to come back here (hopefully next year) as an alumnae of Penn State to see the university from a different perspective. Hannah and I during the first Canning Weekend of the year. I know my four years here have not always been easy, both personally and through the adversity the university had to overcome. But when I walk across the stage in the Bryce Jordan Center next Saturday, I know that everything I went through will be worth it because I attended the best university in the world and had the time of my life. I encourage all future Penn Staters to embrace and enjoy the four years that you have here, meet lifelong friends and create your own memories. 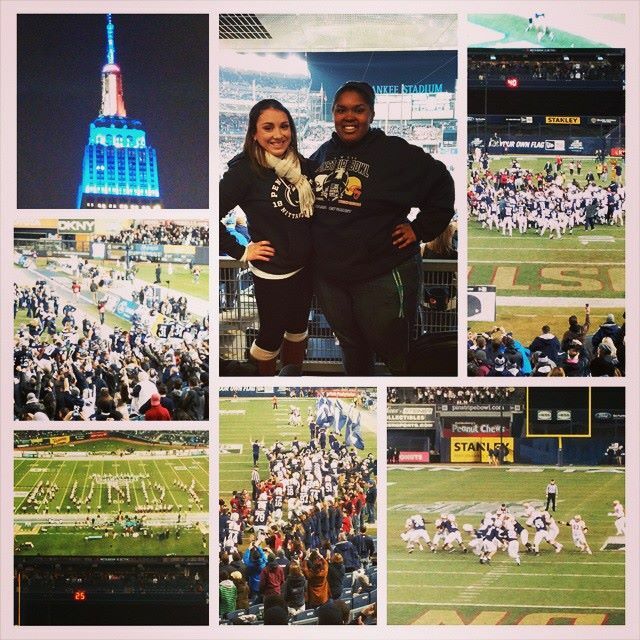 Highlight of senior year: Going BOWLing in Yankee Stadium with the Penn State Nittany Lions and one of my really great friends, Michelle. Well, the last week of classes is fast approaching (ahem, starting tomorrow!). The fact that this is my last week of college classes is mind-blowing. If you’ve been reading my blogs this semester, you’ll know that I love giving advice to incoming students and expressing how much I will truly miss Happy Valley when I walk across the stage in the Bryce Jordan Center on May 9. The good news is, my advice will not stop now just because we are in the home stretch and closing in on the end of the semester. 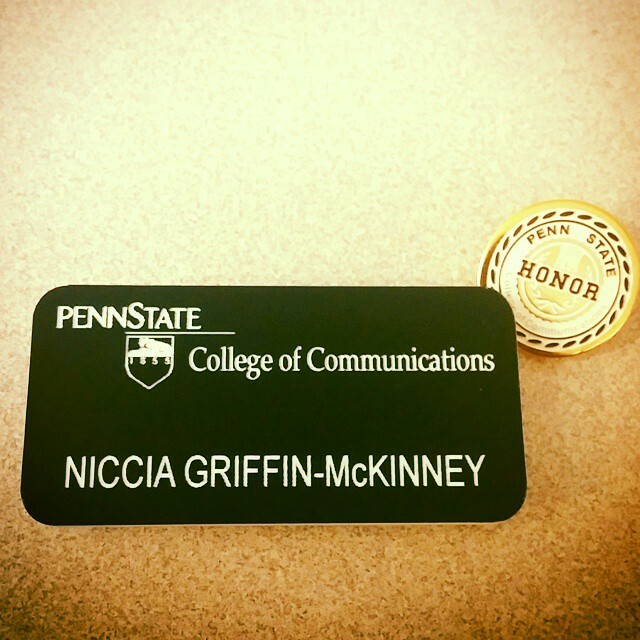 The bad news is, this is my second to last blog post and I will be saying goodbye to Penn State in less than two weeks. With the final week of classes approaching, I want to give some advice to students on how to handle their last week of classes and prepare for finals week. 1.) First of all, pat yourselves on the back for making it through the year and embrace it for a minute! 2.) After your inner happy dance, remember to finish off the semester on a strong note. Even though it’s the last week of classes, that last week can make a difference with your final grade and how you prepare for finals week. 4.) If you have a daily planner, I suggest making day-to-day To Do Lists so you don’t forget an assignment or to write a paper. If you don’t have a daily planner, I highly recommend buying one, because they are blessings to have during the academic year. 5.) STUDY! STUDY! STUDY! Your final exam schedule can be found here. Go onto the Elion and check out your schedule. So when you get your exam schedule midway through the semester, figure out how you’re going to manage your time so you can study for your finals. Follow these five tips and you should be golden during finals week! As I finish up my senior year at Penn State, there are events and things I have to do one last time. Going to the Blue-White game is one of those events! The Blue-White game is the official kick-off to the new football season where the football team scrimmage each other in front of thousands of fans and occurs during Blue-White Weekend. While the Blue-White game does not bring in the 107K strong as most of the games during the regular season bring, fans from all over still come to watch and celebrate the upcoming season. However, the Blue-White is just the icing on the cake for the weekend. Blue-White Weekend is the equivalent of a family reunion. Former Nittany Lions return for the weekend to participate in the festivities, which this year includes former football players Cincinnati Bengal Devon Still (his twitter), former kicker Sam Ficken (Ficken’s twitter) and Seattle Seahawk Jordan Hill (Hill’s twitter) signing autographs. Fans can also look forward to the Best Man Tim Tailgate, which benefits ALS research for the Best Man Tim Foundation, and of course the the Paterno Family Beaver Stadium Run on Sunday, which benefits the Special Olympics. This is just one of the many traditions that prospective students can look forward to when they become the newest members of the Penn State family. As a student at Penn State, you have the opportunity to meet a lot of fun and interesting people. During your freshman year, and possibly during your entire time at Penn State, you have the opportunity to live in the residence halls on campus. Without the dedication and assistance from the Resident Assistants (RA) that live in the residence halls, living in the halls could be overwhelming and a little crazy. When I transitioned to University Park, I met Katie Kappel, a junior public relations student. Katie is also one of my fellow College of Communications Student Council Executive Board members. 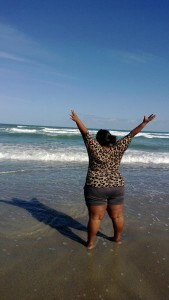 She has gladly allowed me to interview her about her experience as an RA. 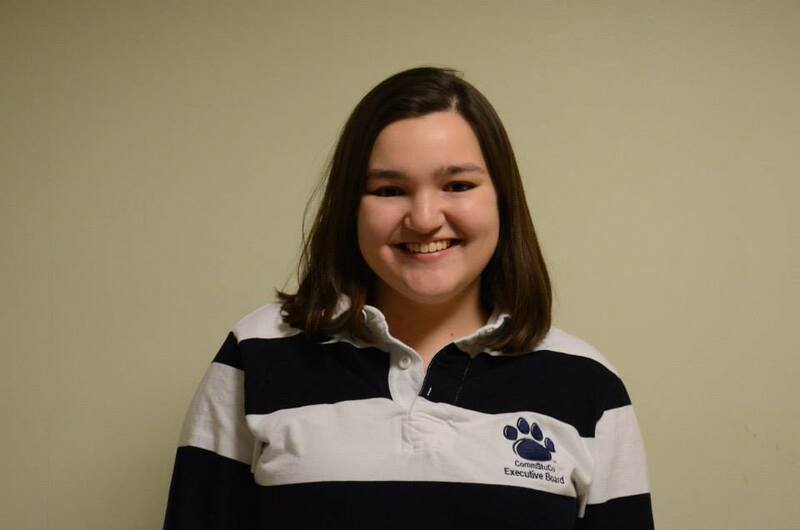 Katie has also provided advice and links for any prospective student that is interested in becoming an RA once they arrive at Penn State. My first semester as an RA was Spring 2014. Since then I’ve been an RA for Summer 2014 and this entire academic year. 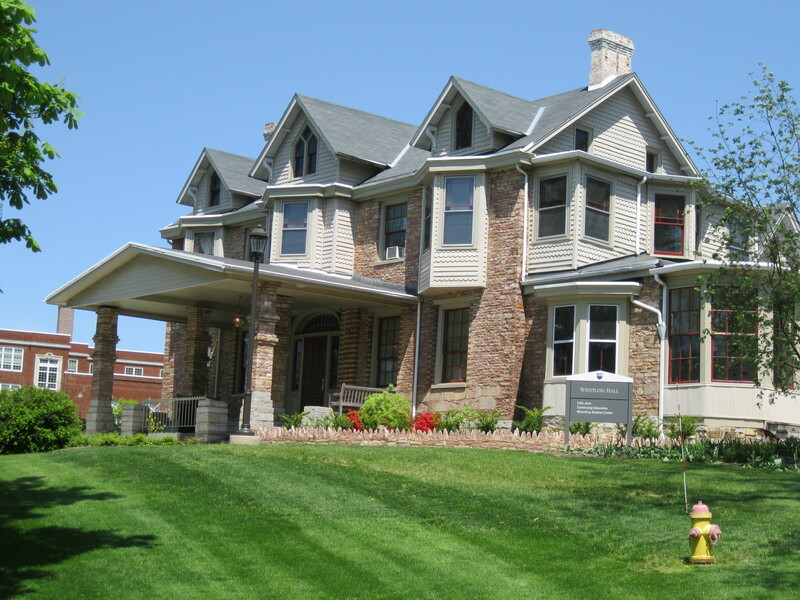 Which residence hall(s) do you assist in? I’m the RA for the 10th floor of Pinchot Hall in East. Why did you want to become an RA? My parents were both RAs at Bloomsburg University, so it was always on my radar. 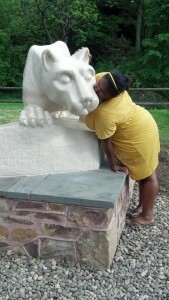 I love Penn State and for me one of the best ways to show my Penn State Pride is to share it with each incoming class. I want to help first-year students get the most out of their first year at the greatest university in the world. 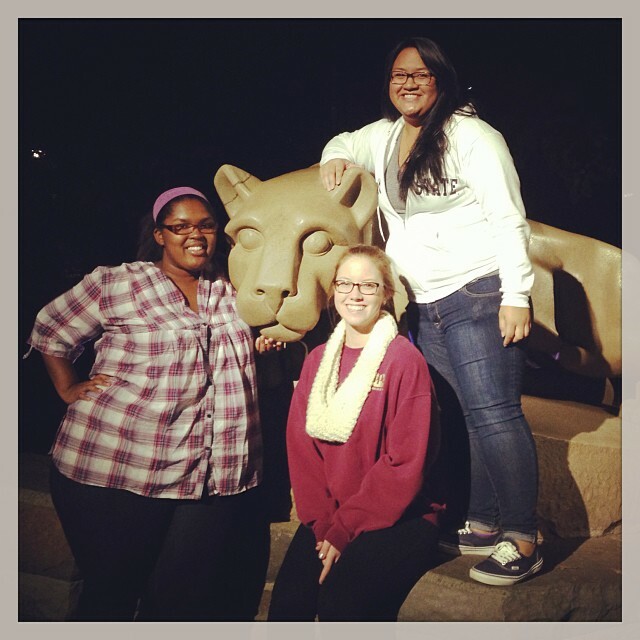 From an RA’s prospective, what advice would you give to incoming freshmen at Penn State? My best advice to incoming first-year students is to keep your door open as much as possible during your first few weeks. That’s the best way to get to know people on your floor… and your RA! Also, anything you might be worried about or have questions about…you’re not the only one! Don’t be afraid to ask questions. As an RA I live on a floor with, in my case, 30 co-ed first-year students. It is my responsibility to foster a safe and supportive community for my residents. I view myself as a friend and mentor to my residents. I plan activities for them to get to know each other and campus in a variety of ways. I also enforce residence hall policies and mediate conflicts when necessary, but that is only a small part of my life as an RA. My favorite part of the job is being a resource to students about all things Penn State! If prospective students wish to become an RA, what process must they go through to do so? The first step is to attend an information session. There are multiple session held during both fall and spring semesters. Just look for posters advertising them in the residence halls and commons. Following the info session there is an application and interview process. To apply you must have at least 12 Penn State credits, a 2.40 GPA and be in good conduct standing with the university. Candidates are then selected from that process to take HI ED 302 (The Role of the Resident Assistant: Theory and Practice). This three credit course is an overview of all the roles of an RA. If you get a B in the class and a recommendation from your instructor, you will be eligible for pick up! What has been your toughest obstacle to overcome as an RA? My toughest obstacle was adjusting to the position during my first semester as an RA. Starting as an RA in the spring was a unique challenge because I came into an already established community of residents. Also, I had never lived in East before, so I had to adjust to a totally new environment. That first semester was difficult at times, especially balancing my new RA position with the other organizations I’m involved in (THON and the College of Communications Student Council). But I wouldn’t change a thing and I am thankful for those challenges. It’s honestly too hard to pick just one. My favorites include whenever I’m able to help one of my residents, or when one of my previous residents sees me around campus and says hello! What are the perks of being an RA? There are so many personal and professional perks of being an RA! I’ve met so many amazing people as an RA and I am very thankful for the mentors and friends I have gained because of it. Also, there are skills that I’ve learned as an RA that are transferable into the workplace, such as conflict mediation and time management. It’s a great leadership position to talk about during job interviews. Katie has provided links for prospective students interested in becoming an RA below. So do you want to be an RA? It sounds like a pretty rewarding and fun experience! You thought I meant gaining the Freshman 15, didn’t you? For those of you that do not know what the Freshman 15 is, it’s a commonly used term to describe the act of incoming freshmen to college gaining 15 pounds when they begin their college journey. However, this is a list of things to keep in mind to survive your first year in college, not how to keep those potential 15 pounds down. I’ve created a list of survival tips for the high school seniors about to embark on what I’d consider the best 4 years of your life. I never had these tips when I was finishing up my senior year of high school. I believe that using these tips are great to follow and could help you with your remaining three years of college. Before you begin taking your fall courses, find your classes. I realized I was transitioning to the University Park campus from Mont Alto and would be attending a campus on a much larger scale. After completing my course registration, I decided to take a trip to the University Park campus with my mom to find the buildings my classes would be located. Whether you step foot on campus fully aware of what you want to major in or you are just as clueless as I was, getting to know your adviser is something that is vital in being successful in college. Your advisers aren’t just there to help you pick your courses for the upcoming semester, but they may also act as life coaches. They want you to succeed and will help you. I’m here to tell you I am always in the advising office in the College of Communications and I know that if I need something or advice, my adviser will gladly help me. There are a ton of clubs and organizations to get involved in, especially here at Penn State. Finding a club or organization to get involved in will allow you to meet fresh faces and create lifelong memories. 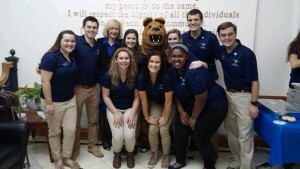 It sounds cheesy I know, but I met some of my best friends when I joined Lion Ambassadors at Penn State Mont Alto. 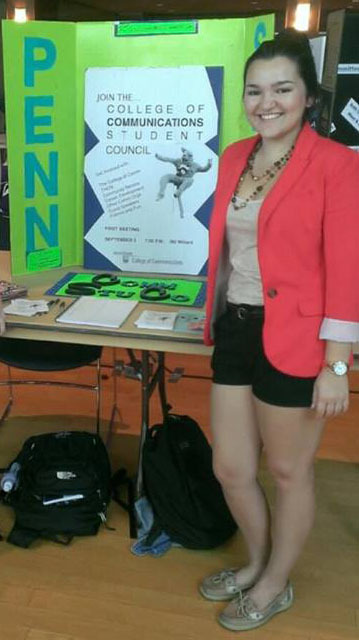 Every semester an involvement fair is held for students to sign up for clubs and organizations. I didn’t attend my first Penn State football game until freshman year. I drove two hours from Mont Alto to go and it was probably one of the greatest experiences of my life. Whether you’re there to cheer on the Nittany Lions or watching our fantastic Penn State Marching Blue Band, this is something students should witness at least once. Walking into Beaver Stadium and feeling the pride of this university is completely eye-opening and it’s where I realized this is where I belong. One of the many football games I attended freshman year. 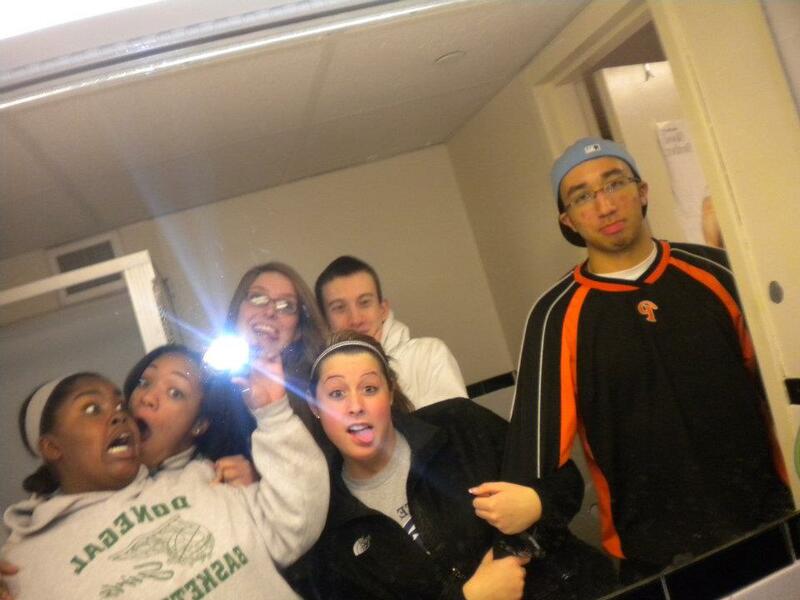 Freshman year dorm life with some friends I met on my floor. This one could be a little tough and possibly slightly depressing, but coming to a school with 45,000 students can be overwhelming. Don’t get discouraged, this isn’t supposed to scare you, but be aware that if you’re having a really rough day or week, Counseling and Psychological Services (CAPS) is a great place to go. A lot of students go through freshman jitters…it is okay! CAPS is great for helping students that are homesick or suffering from anxiety, so don’t hesitate to stop into the offices. And your tuition covers your first 6 visits! Win win! Penn State has a lot of different websites that students may need to use, but these are the most commonly used websites. Elion is a website that students use when they need to stay updated on their financial aid, checking final grades, their final semester schedule and many other things. Webmail is used to check your student email. Once you get your user ID, which usually is your initials and a set of numbers (i.e. mine is nzg5060@psu.edu) you will be able to access it. The Schedule of Courses site is where you will find a list of courses you may select from every semester. ANGEL is the site you use when you need to submit coursework for classes, email your professor and check your grades throughout the semester. New Student Orientation (NSO) is held in the summer time for students to get registered for classes, meet their advisers, get their PSU IDs and overall get a feel for the campus prior to the start of the fall semester. NSO is another great way to meet new people. Whether you choose to get involved with the largest student-run philanthropic organization in the world or not, THON is another great way to witness the magnificence of what Penn State is all about. It’s a great weekend to see what the student volunteers at Penn State do to make this event possible. My first THON with my good friend, Courtney. Downtown State College has restaurants, places to study and of course many shops to start your Penn State apparel collection! It’s always great to get a quick pick me up coffee downtown before your next class or meet up with some friends for lunch or dinner. Thankfully (or not, depending on how you feel about smartphones) we live in a world where our phones can guide us through the day. The amount of apps that can help you navigate around Penn State is astounding. My fellow intern, Sophia wrote a blog post about the useful apps that students use. 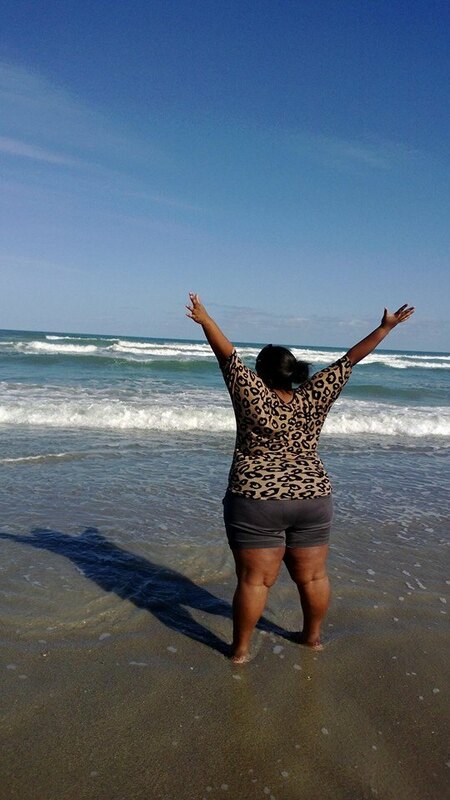 If you haven’t already done so, check out her post here. I know it’s freshman year and it’s your first time away from home, so what do you do? You go a little crazy with your newfound freedom. However, school does come first and you (or your parents) are paying for you to go college, so homework obviously has to be done. Don’t forget why you’re in college in the first place, so make sure that your studies are a priority. Slacking off freshman year is a big no no! I know what you’re thinking…why do I need to do that if I’m only a freshman? Depending on what you plan on doing after you graduate from college, you may want to get a jumpstart on networking with faculty, staff and alumni if possible. Don’t hesitate to start building your resume early, because the more experience you have the better. Start this early as well. Juggling classes, possibly work and extra-curricular activities can be hard especially during freshman year. By being able to manage your time and prioritizing during your first year, it will make it a lot easier when you’re in your core classes and juggling bigger assignments, jobs and internships. Remember that time flies and just enjoy it! You’re only going to be a freshman in college once, so just embrace the fact that you’re really here and succeeded in making it to college. Before you know it, you’ll be like me struggling to deal with the fact that your four years is up and the real world is calling your name. Live it up and enjoy being a college student! Our beautiful Lion Shrine with my friends Cassidy and Leakana. 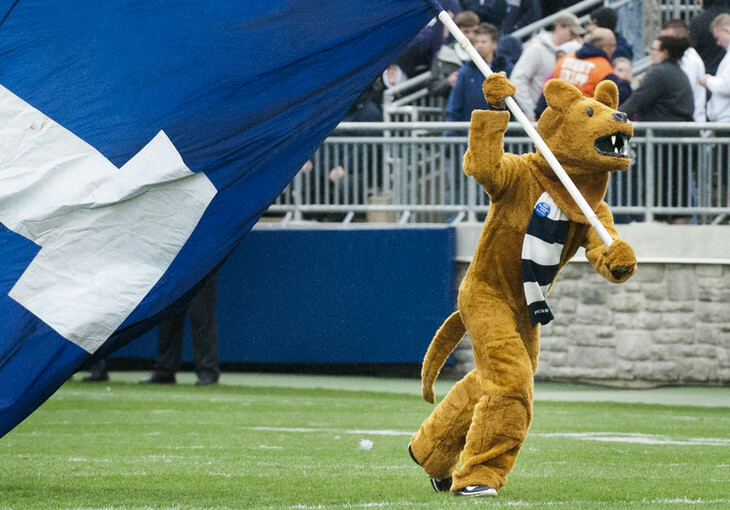 When I began my college career at Penn State, I wanted to pursue a business degree. Little did I know that would change when the course requirements for this particular major would include way too many math classes for my liking. My pursuit for a business degree quickly changed and I found myself enrolling in the Division of Undergraduate Studies to figure out what my options were. While I was in the process of figuring out what I wanted to do with my life, I became heavily involved with the Lion Ambassadors organization at Mont Alto. As a lion ambassador, I had many opportunities to attend both small and large college fairs. My last day at Mont Alto. To my surprise, I really liked speaking with students and sharing my Penn State experience with them, in addition to offering my advice to them if they were interested in attending Penn State. I would also provide campus tours for students and their families. Sometimes one tour with me would be what the student needed to decide to attend Penn State. If they were undecided at the time, they would choose Penn State and specifically Penn State Mont Alto. It blew my mind! If I could recruit students to a university successfully without much experience, how much of an impact would I have on students if I gained more experience? My experience as a tour guide and representative for the admissions office at Mont Alto made me realize what I want to do when I graduate in May. My first major college fair in Atlantic City, NJ freshman year with Michelle (l) and Sarah (r). 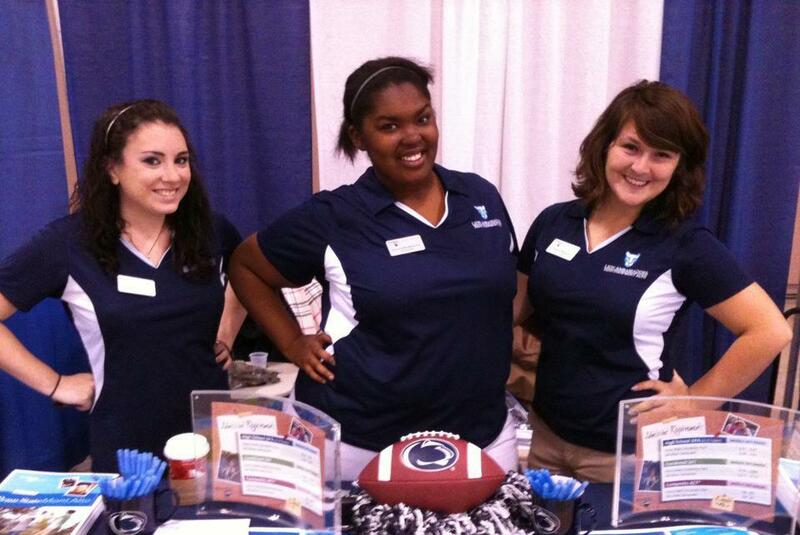 I want to work in admissions and help recruit prospective students-hopefully at Penn State! I love being able to meet students and help them begin their journey to college. 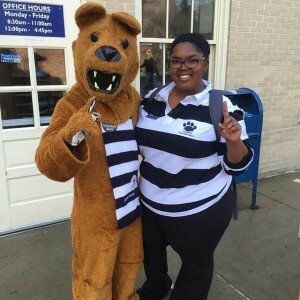 My passion for working in admissions and the connections I made while I was at Penn State Mont Alto was helpful when I became a social media intern for Undergraduate Admissions. My advisers at Mont Alto and University Park saw what I was capable of through events I have planned and my interactions with students, which is something my supervisors at my internship noticed during my interview. The purpose of this blog entry is to encourage prospective students to make connections with professors, advisers and other students at Penn State. Get involved with clubs and organizations because I guarantee you will create lifelong friends and bonds with people you meet here. You never know…having those connections could help you in following your dreams and preparing yourself for what’s to come after you leave Penn State. Those connections have definitely helped me. THON 2015 is just two days away! After fundraising, participating in canning weekends and planning events all year to raise money in an effort to win the battle against pediatric cancer, over 700 dancers will walk into the Bryce Jordan Center (BJC) and dance for 46 hours to celebrate this year’s accomplishments. 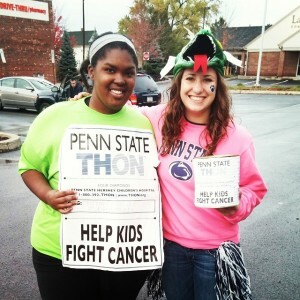 My fellow intern Sophia previously wrote on THON and what it’s all about in her 101 of THON post, so if you haven’t read it, please check it out! While I would have loved to be one of those dancers on the floor of the BJC this weekend, I have the opportunity to live vicariously through one of my best friends who has the opportunity to dance this year as one-half of an independent dancer couple. My friend, Michelle and her dancer partner and friend, Justin raised over $10,000 for the For Diamonds Fund through canning weekends and sending out THONvelopes to their friends and family. Michelle, second from the left, with her dancer relations liaison, Corbin (far left), dancer partner Justin and his dancer relations liaison, Kayla. Michelle and Justin will not only dance for 46 hours straight, but will do so without sleeping and will be standing the entire time. It’s been rewarding to be go through this process with Michelle, because she has wanted to dance since our freshman year. Now that it is our senior year, it’s great to see her celebrate all of her accomplishments with THON. 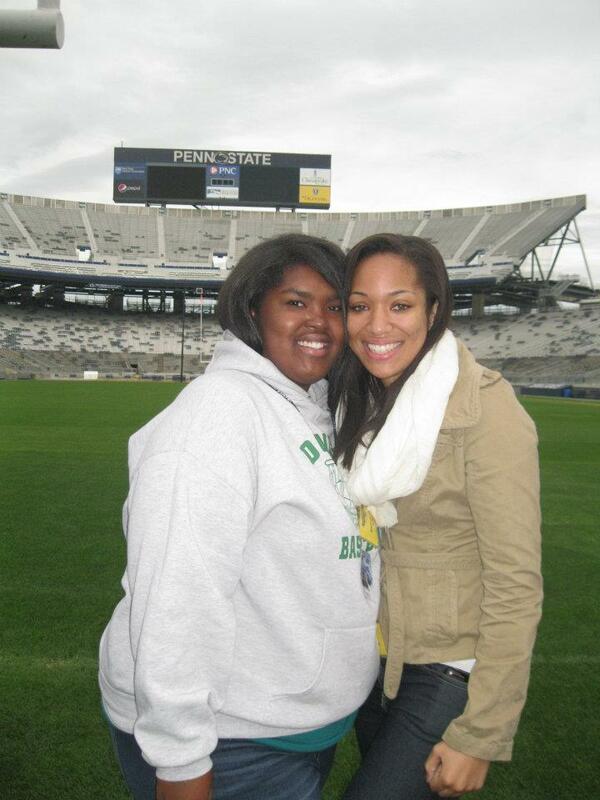 We met at Penn State Mont Alto, where she was a Canning Captain during our sophomore year. When we transferred up to University Park, she was a committee member for the Rules and Regulations committee and this year she is on the Communications committee. Now that she is dancing, Michelle has changed her eating and sleeping habits (she must sleep at least 8 hours per night) to prepare for 46 hours of no dancing and no sleeping. Since last week, we have been shopping for her necessities and other things she would need for the weekend and it’s been so fun! Her family and friends have sent her dancer mail to keep her motivated during the tough times throughout the weekend as well. Following THON Weekend, I will be interviewing Michelle on her THON experience so stay tuned for In the eyes of a THON Dancer Part 2 and if you’re in State College this weekend, come and be a part of the phenomenal, life-changing experience that is THON! P.S: What to know what it was like dancing in THON? 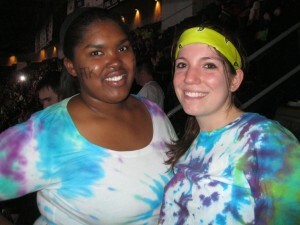 Check out Michelle’s post-THON interview here! Penn State is one university geographically dispersed throughout the commonwealth of Pennsylvania. There are a total of twenty-four Penn State campuses; twenty of them are commonwealth campuses, while the remaining four are special unit campuses. The four unit campuses are Penn State Dickinson School of Law, Penn State Hershey Medicine, Penn State Great Valley School of Graduate Professional Studies and Penn State Williamsport or the Pennsylvania College of Technology. 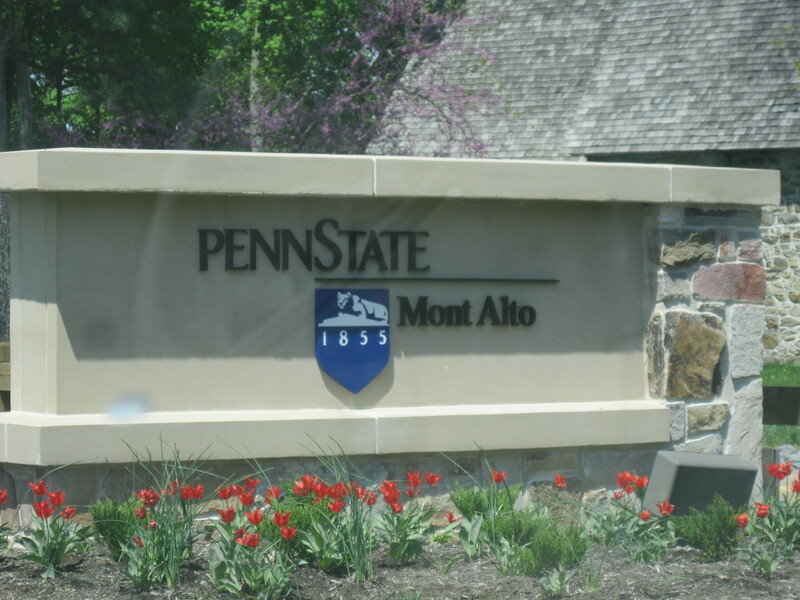 Mont Alto is one of Penn State’s 24 commonwealth campuses, located in south central Pennsylvania. For this blog post, I want to talk about Penn State Mont Alto. As stated in my previous posts, I attended Penn State Mont Alto during my first two years at Penn State as a Division of Undergraduate Studies student in order to complete my general education courses and decide on a major to pursue. Penn State Mont Alto makes you feel welcome as soon as you enter the campus. 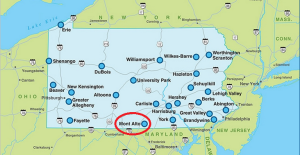 Mont Alto is located in south central Pennsylvania right above the Maryland state line. The campus is approximately thirty minutes from Hagerstown, Maryland, twenty-five to thirty minutes from Shippensburg University and is next to the Michaux State Forest and the Appalachian Trail. If you’re from out of state, Mont Alto is 89 miles from Washington D.C., 222 miles from New York and 186 miles from Richmond, Virginia. 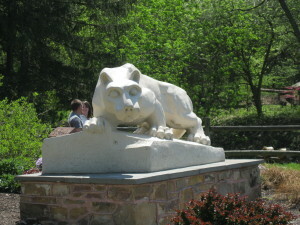 Penn State Mont Alto has its own Nittany Lion Shrine. It’s 1/3 the size of University Park’s Nittany Lion shrine. At Mont Alto, students have the option of obtaining an associate and/or bachelor’s degree in a select few options. For an associate’s degree, student may obtain a degree from Mont Alto in: Business, Forest Technology, Human Development and Family Studies, Information Sciences and Technology, Letters, Arts and Sciences, Occupational Therapy, and Physical Therapist Assistant. Students also have the option of obtaining a minor in: Business, English, Women’s Studies and Security and Risk Analysis. 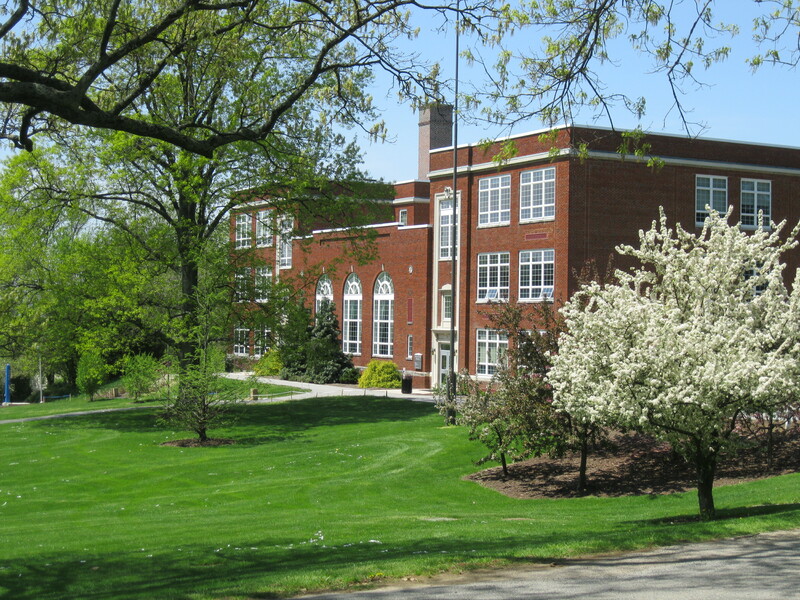 Mont Alto is well-known for its forestry and nursing programs. Before the campus was Penn State Mont Alto, it was the Pennsylvania State Forestry Academy in 1903, the state’s first academy in forestry. Mont Alto is the second oldest campus in the Penn State system behind University Park. Mont Alto’s General Studies Building. Penn State Mont Alto has had a very rich history before and during its induction as a Penn State campus. While it was the forestry academy, first year students were required to bring a horse with them to campus. Want to learn more? Head over to the interesting facts webpage here. If you’re interested in playing sports, Mont Alto has varsity men’s and women’s sports, as well as club sports available. The active men’s sports are: basketball, baseball, cross country, golf, soccer and wrestling. For women, you have the option of playing basketball, cross country, softball and volleyball. Students that may not like to play competitive sports may participate in club sports like: men’s volleyball, cheerleading, intramurals, women’s soccer, woodsmen team and the dance team. For more information on Penn State Mont Alto athletics, visit their page. Sports not your thing? No problem! Mont Alto provides students with a semester long activities calendar at the beginning of the semester The calendar includes all of the campus activities and events held during the semester. Wiestling Student Center where many activities are held. Students also come here to study. Some of these activities include tailgate parties during the football season, shows from comedians, dances, bingo nights, movie nights and many more fun activities. Check out Mont Alto’s online calendar of events. 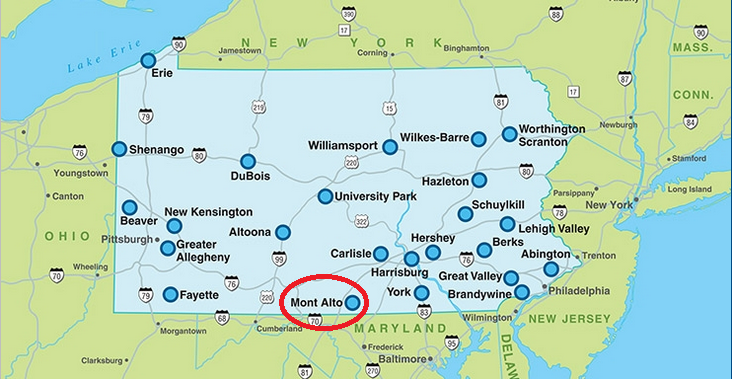 So if you’re interested in visiting another Penn State commonwealth campus, Mont Alto is a great one to check out! If you would like more information on the campus, visit their website at ma.psu.edu. 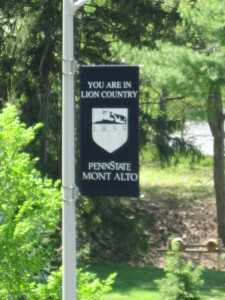 Mont Alto’s welcome sign greets everyone as they enter the campus.